The SPCA announced the launch of phase two of the Catsnip Program, dubbed “Snip Snip Hooray!” which will offer low cost spaying and neutering services to owned and microchipped cats. Snip Snip Hooray! aims to greatly lessen the amount of unwanted cats on the island and, at the same time, ensure that all owned cats are microchipped. The SPCA said one mating pair of unneutered cats can lead to roughly 2,000 unwanted kittens in just three short years; the need for this initiative has never been more apparent and the SPCA is pleased to invite applications for this low cost program. Snip Snip Hooray! is open to all owned cats on the island who are microchipped and have tested negative for Feline HIV and Feline Leukemia [HIV and Leukemia testing is done prior to spay/neuter as part of the initiative]. Owners may take advantage of the SPCA’s Chip Chip Hooray! program and have their cat microchipped for just $20 in conjunction with the spay/neuter procedure. 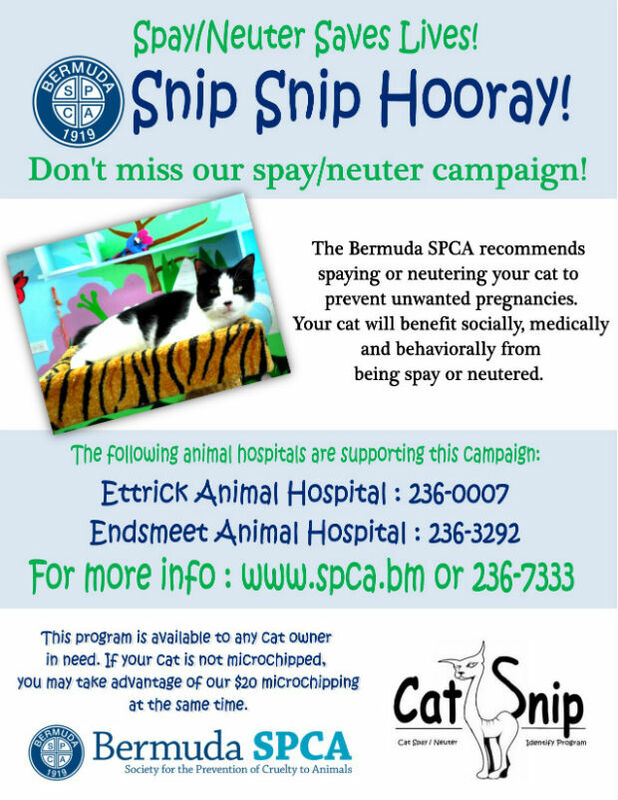 The spay/neuter procedure is a routine and much needed surgery and the SPCA is offering this at a very low cost to the owner at either of the animal hospitals who support this campaign, including Ettrick Animal Hospital and Endsmeet Animal Hospital. The SPCA believes this initiative has numerous benefits to both the cat and the cat’s owner. Spay and neuter benefits the cat socially, medically, and behaviorally by reducing the risk of straying and fighting males and reducing the risk of uterine infections and breast cancer in females. For more information regarding the Snip Snip Hooray! campaign, please visit the official SPCA website website, or contact the SPCA shelter by telephone at 236-7333 or email at info@spca.bm.